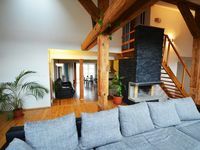 Properties in Roztoky u Prahy average 4.3 out of 5 stars. Sunny Spacious Condo in town centre, Close To Transport, Fun And Tourism. Property 61: Sunny Spacious Condo in town centre, Close To Transport, Fun And Tourism. Property 63: Beautiful studio in Prague center! High End Designer Luxury in the Heart of Old Town. Spacious, quiet, perfect! Property 97: High End Designer Luxury in the Heart of Old Town. Spacious, quiet, perfect! We really recommend this location. Quiet neighborhood, great little corner market next door, many very good neighborhood restaurants and just steps away from useful tram lines (22 and 17). Also walking distance to everything in Old Town and the Charles Bridge and Little Quarter. The apartment is spacious, very clean, with as comfortable a bed as we have ever had when traveling. The kitchen is nice, though no food or condiment items are provided, not even sugar or salt. We understand the owner is concerned with allergens, but this is a negative for those who like to do some cooking. There are two bathrooms, one spacious with a window, but a slippery deep tub and a hand shower, the other small, no window, fan (a bit noisy) but a good shower. However, there isn&rsquo;t a place to put soap and shampoo except on the floor. We would definitely return here if we are ever fortunate enough to visit beautiful Prague again, despite these minor shortcomings. The location, space, comfortable bed and terrific little balcony make up for the other issues. We also recommend that you use the car service from the airport. Vladimir is very nice and helped get the luggage into the small elevator and showed us around the apartment. We really loved Prague. We hope you do too. Great Appartment. We were 8 guys the Appartment is perfectly clean and the host provided us with a 5 star experience (slippers, espresso machine with milk frother etc.) The billiards table was also a great addition along with the Bluetooth speaker. The only thing to know before you book is that you are on a 6 story walk up but if you can handle that it's an amazing experience!